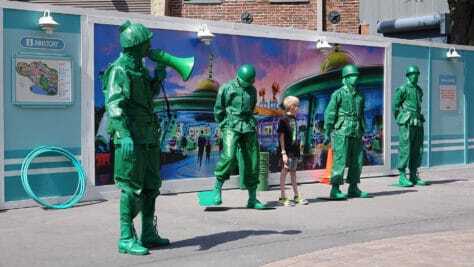 Sarge leads his troop of 3 Privates into the this whacky bootcamp training environment, which is located at the end of Pixar Place in front of the construction wall at the old Backlot Tour. 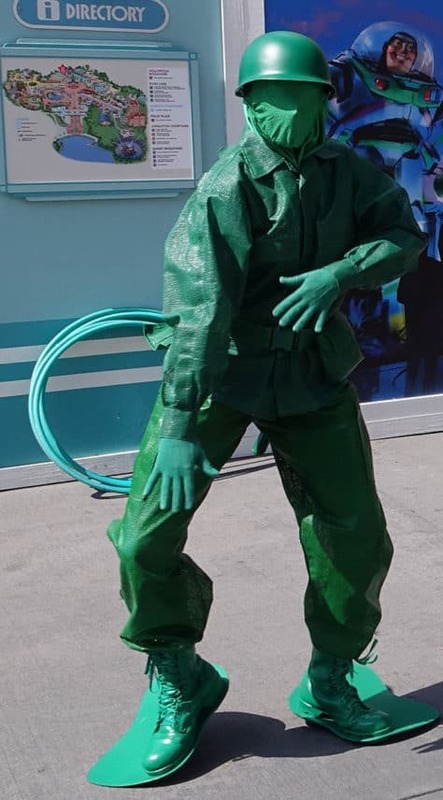 His troops are named Private Dancer, Private Practice and Private Eyes. The fun began with a game of “Sarge Says” in which the troops learn to follow military discipline and order. Sarge barks out an order and the troops obey. It’s all done in good fun. The troops and trainees are then instructed on proper marching form and given orders to march in time, double time, triple time and hammer time. Seeing a bunch of 80’s puns here? Break it down! Private Dancer then set up the first of 3 training challenges which included running through the hula hoops, tossing bean bags into a bucket and an orange cone obstacle course. All this is done while Sarge serves up the cadence. The newest honorary members of the Green Army are then asked to take the Toy Box Pledge and are given this great opportunity for a group photo. It’s a fun 12 minute show that children will enjoy, but it’s not listed in any Times Guide, app or website. 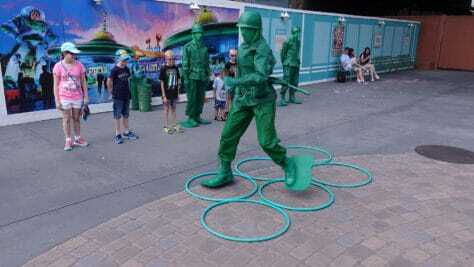 I found it at 10:30am and at 11:30 am the Army Men were doing their basic patrols (meet and greets). I guess I’ll need to spend a day there figuring out another schedule, huh? Is this show still taking place daily at 10:30am? 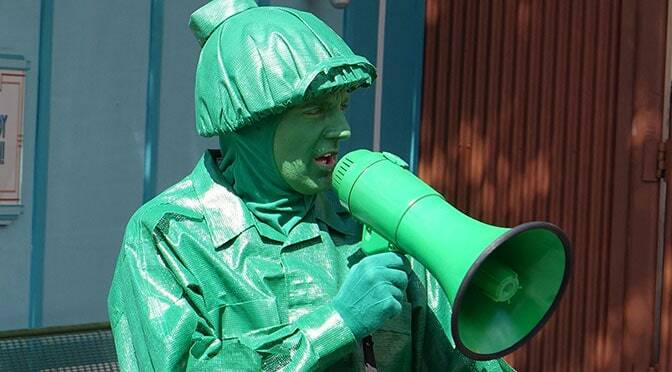 Are the army men no longer meeting? I do not see them on your character locator anymore. My husband is really hoping they are still meeting. They do meet and they offer a little show. Any idea if this is still happening and when? Thanks!! Has Disney added a schedule for this show yet? Any word on if this is ongoing? We will be there in September and hope to participate. Do you think the show is still 10:30? Where did you find it? Thank for for keep us informed! Do u think I could get a quick pic with sarge and autograph? Not when they are doing these shows. Fun! I hope they keep this. My kids would love it. So it,s just for kids?, or adults and teenagers too? Our kids participated in this during our recent visit….as did the parents for a brief time.